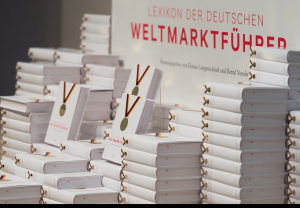 As part of the annual congress „Summit of World Leaders“ on January 27, the publishers Dr. Florian Langenscheidt and Prof. Dr. Bernd Venohr presented the new edition of the “Lexikons der deutschen Weltmarktführer”. They have selected companies who have developed an excellent market position with their products on the global markets. Kampf Schneid- und Wickeltechnik GmbH & Co. KG as the world’s largest manufacturer of slitting and winding machines was also included in the lexicon. The decisive factor was the comprehensive product portfolio, which includes in addition to the slitting and winding machines, winders for the manufacturing and finishing processes as well as related services e.g. service packages and handling systems. The comprehensive portfolio and the high quality standard distinguish KAMPF as world leader. “German world market leaders stand for quality and technology leadership, „emphasized Dr. Florian Langenscheidt. However, this is rather unknown to the general public. The lexicon documents how companies have managed to world leadership through innovation and performance. The first copy was given to the Minister of Foreign Affairs, Dr. Frank-Walter Steinmeier, one day before the premiere. On this occasion, he contributed a greeting to the new edition of this standard work. It said: „The success of German world leaders is the result of more than a keen sense of market opportunities and outstanding innovations. Reason and responsibility and long-term orientation – these are the values which guide the actions of these companies and them an excellent reputation”. KAMPF presented topics beyond its core competencies slitting and winding! 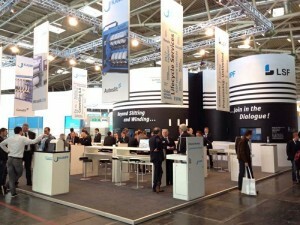 The fair “International Converting Exhibition (ICE)” was held for the ninth time in Munich. From March 10 to 12, an exhibition area of about 11.000 m² provided a platform to the international converting industry for topics and offerings around materials, machines and services of this branch. KAMPF gained the interest of the visitors with its slogans „Beyond Slitting und Winding“ and „Join in the Dialogue“. The booth was very well attended throughout the show time. The exhibition motto opened the dialogue on future production and presented subjects beyond the core competencies slitting and winding. Kampf LSF appeared with the slogan „Processing.Unlimited“. 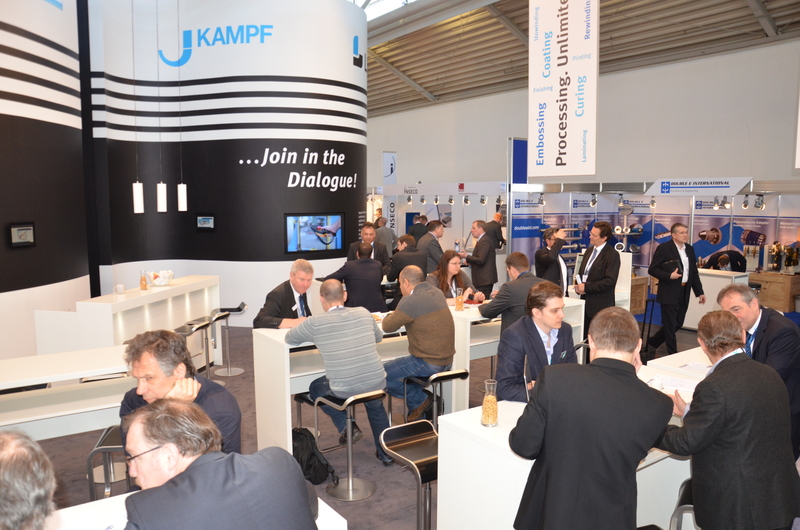 KAMPF found a strong partner in Kampf LSF with regard to process technology and special winding machines. For the first time, the two companies jointly exhibited at the ICE. At the information terminal „Converting 4.0“ interested parties were given an insight into the first results and concepts on the issue of computerization of operating processes. With the project 4.0“ KAMPF followed a holistic approach to optimizing the entire production. The exhibits – an automatic blade changer, the new friction elements and the innovative hot knurling unit – received much attention. These exhibits show a small selection of the many detailed solutions and enhancements which lastingly optimize the benefits to the operator through increased functionality and quality of the machines and products. The KAMPF Academy, part of the KAMPF After Sales Service, presented this year’s comprehensive range of courses to the international audience. The team was very satisfied and it received specific inquiries and new ideas. We thank our visitors for their interest and valuable discussions! Converting 4.0. With the project „Converting 4.0“, KAMPF enters into a dialog on computerisation and cross-process solutions for future production. The team presents the start of developing new concepts for networked processes looks forward to a lively exchange! Processing.Unlimited and Winding.Unlimited For the first time KAMPF and Kampf LSF, the new KAMPF subsidiary, jointly introduce to the international audience. Improvements and details Exhibits show special detail solutions for an extended customer benefit. 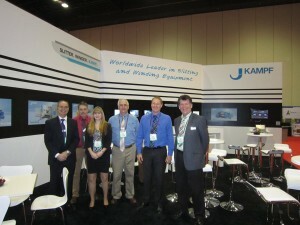 The organizers as well as the KAMPF team commented positively about ICE USA. Several thousand converting professionals from nearly 50 countries came together in Orlando, Florida, February 10-12. The comprehensive KAMPF-Portfolio was presented by KAMPF Machinery Corp. USA team together with the german KAMPF specialists to the interested professional public. The conversations made with the visitors of the well frequented KAMPF booth were very revealing, informative and promising. The main topics Conslit series as well as new solutions for the label industry lead to new projects and inquiries. Thank all our visitors for their interest, confidence and positive feedback!